Fired up Astrometry.net, logged in, and loaded the FITS. It identified the galaxy quickly: NGC 4417 (with NGC 4424 to the south). Oh my. This suggests there's an error in the BGO catalogue. Also neither NGC 4437 nor 4417 RASC Finest entries. I'm more confused than ever. Still, it is an interesting photo. Two in the view! 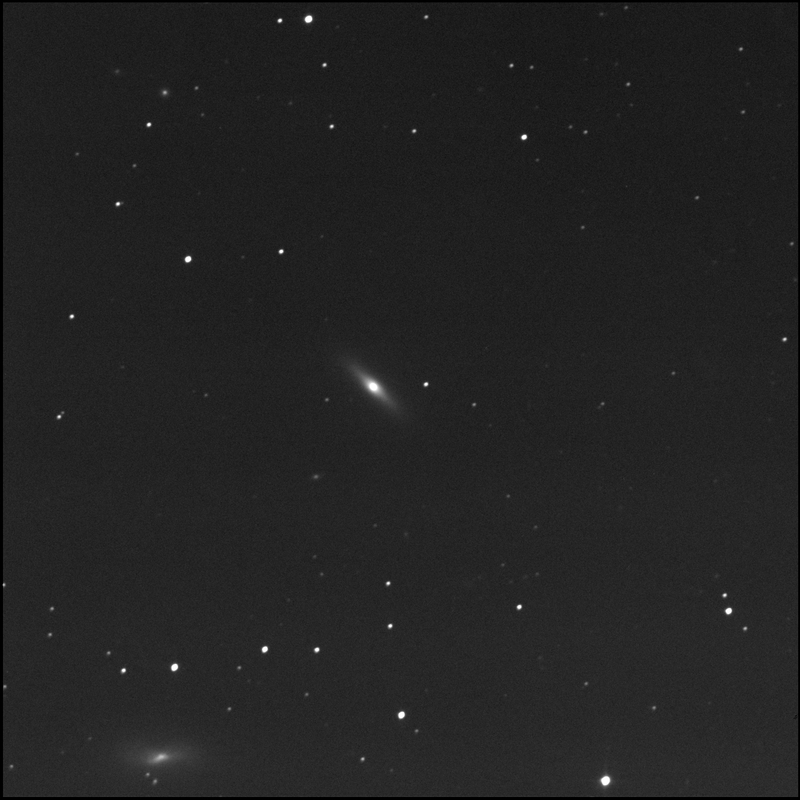 Virgo galaxy NGC 4417 aka PGC 40756 appears to be a lenticular with no discernible structure in the canted disc. The core is very bright. South-west of 4417 is a very low contrast but soft smudge. It is more apparent while panning. It is north-east of and near the star GSC 874-423. This is PGC 40722. There is a very small oval to the south-east of 4417. This is LEDA 213990. Near the bottom-left of the image is the very large distorted galaxy NGC 4424 aka PGC 40809. 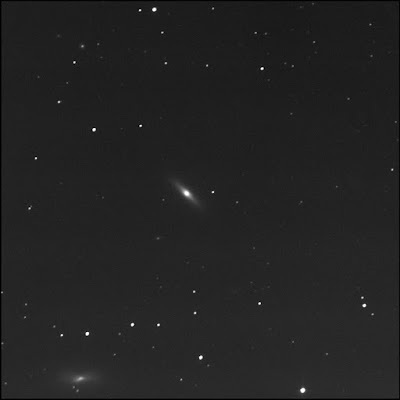 Astrometry.net also identified it as IC 3366. The outer limits of the galaxy appear fan shaped. There are hints of structure near the muted core. North-east of 4417 and well away is a round star-like object. This is PGC 40815. It almost looks like a globular cluster. Up and left from this is a much dimmer fuzzy: LEDA 1369041. I want 4517 as this is the entry in the handbook. The same thing happened last summer, when that neutron star collision was detected. Its host galaxy was NGC 4993, which is also miscategorized as NGC 4994. There are lots of errors in the NGC catalogue, as I think you know. 4993 was discovered by William Herschel using a 19-inch speculum reflector in Slough on March 26th 1789. The New General Catalogue wasn't consolidated until 1888, but Herschel gave it a designation with his own nomenclature. It was rediscovered by his son, John Herschel, on the March 25th, 1836, who categorized it using a different nomenclature. When the NGC was consolidated, the two entries were not recognized to be the same object. Yep. I also know of issues with NGC 4884 and 4889.